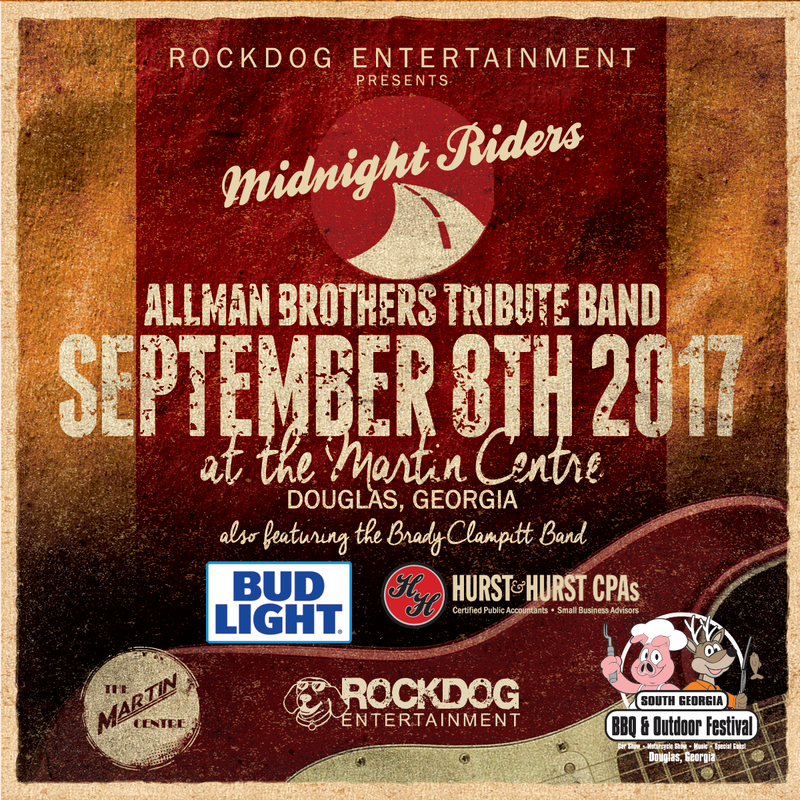 Based out of Music City USA, Nashville's own Midnight Riders are the premier Allman Brothers. tribute band, bringing timeless southern rock to enthusiastic audiences from Georgia to Michigan and all points in between. Consisting of seasoned road and Music Row veterans, this group brings the passion and artistry of the original Allman Brothers lineup to every show. Paying homage to the early years and classic songs of The Allman Brothers. 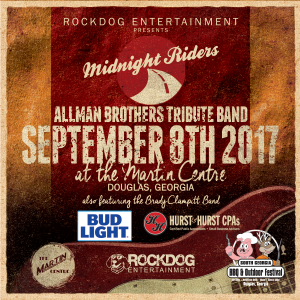 Band, The Midnight Riders are the Mid-South's premier tribute band. With their roots planted deep in Southern tradition they bring an authenticity to their shows that has had audiences spellbound. Soaring twin guitars, exceptional vocal displays and dual drummers are the hallmarks of this bands presentation. With the most authentic performances this side of The Beacon Theater, the Midnight Riders do not disappoint. Brady Clampitt is a vocalist/guitarist and Berklee College of Music Alumni from Jacksonville, Florida. At 32, he is now as ever a versatile live performer singing and playing guitar, keyboards, and lap steel. The live band shows are full of energetic rock and roll, blues, funk, and soul while being subject to a hard left turn to honest ballads and uplifting gospel. Brady has become comfortable playing the national level shows and opening up for such artists as Blackberry Smoke and Brantley Gilbert. However, he will never miss the chance and could not be more proud than to rub elbows in his local hometown scene with the likes of JJ Grey and Tedeschi Trucks Band. His original music provides the foundation for his performances and yet touches and embraces: roots, motown, oldies, and country music genres. Brady's live performances are anything but routine and shouldn't be secluded to one genre, but more so a culmination of intrinsically composed elements of many.